Pioneers in the industry, we offer as 06-ir (e) urinal flush valves, battery operated sensor urinal flusher, automatic sensor toilet flusher, battery operated sensor toilet flusher, battery operated urinal flusher and automatic urinal flush sensor from India. · Solenoid valve, Flow control valve & Electronic system are located in the concealed box. All components are accessible from front for easy maintenance. 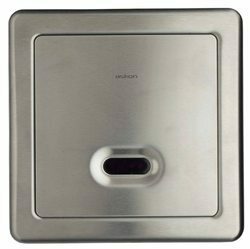 · Screwless Stainless Steel 304 front plate with brush finish. · Brass solenoid valve with piston valve technology. This is a marked improvement over traditional rubber diaphragm-type valves. · Solenoid Valve is removable and operates on 6VDC. · Sensing range and flush timing can be adjusted with remote. · 360° debris screen (filter) reduces the common problem of water running and flooding. · Non-corrosive & highly durable polycarbonate concealed box. Dimensions : W 130 x H 130 x D 72 mm. · Water inlet & outlet supply connections of 1/2" B.S.P. · Integrated sensor and control circuit is completely sealed with resin to give moisture free life. 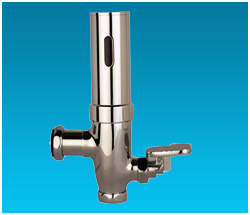 · Brass water flow regulator valve allows water flow to be adjusted & turned-off as desired. · One remote works for multiple systems. To be purchased separately. Our offered Battery Operated Sensor Urinal Flusher is designed with advanced electronic technology for high sensitivity and stability. Its touch-free usage promotes elimination of cross-contamination. This finds its wide range applications in hospitals, dental clinics, hotels, restaurants, factory, laboratory, schools, top office buildings and many public areas. Our offered Automatic Sensor Toilet Flusher design provides accuracy with advanced electronic technology that enhances water efficiency. Its durability is facilitated with stainless steel panel, outer rim and control box for dezincification resistance. 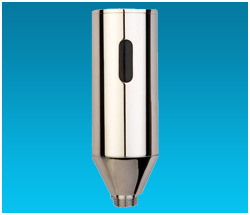 Furthermore, its solenoid valve shuts off automatically when battery is weak for durable and effective use. Our offered Battery Operated Sensor Toilet Flusher is designed with fully chrome plated brass body and brass solenoid valve. This is one of our most looked upon product due to its quality, durability, value and virtually maintenance-free performance. 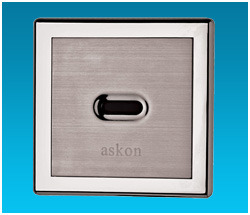 Additionally, the chrome finish creates a bright, highly reflective, cool grey metallic look. Our offered Battery Operated Urinal Flusher provides practically maintenance-free performance and robustness. 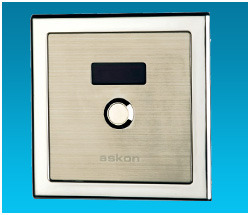 Its fully automatic IR sensors provide convenience in use and pre-wired remote solenoid valve allows flexible sitting. 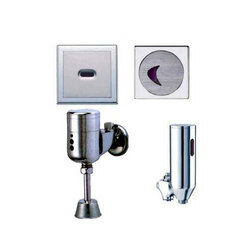 Moreover, the built-in water flow regulator can be turned off as desired ensuring better water conservation. Electronic control components are filled with resins and sealed with ultrasound process to give moisture free life. Valve water Pressure can with stand 0.01 bar to 10bar. ½” water inlet & out let. Sensing range, flushing time & flushing volume of water can be adjusted as per requirement.